← The Bees Are Mad At Me! So I went out the next day and the bees appeared to have settled down. Below are a couple of pictures. 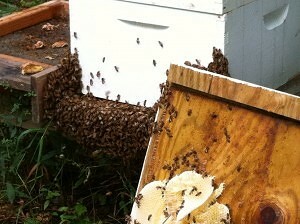 If you look closely at this picture you can see a hive top board leaning against the front of the hive. 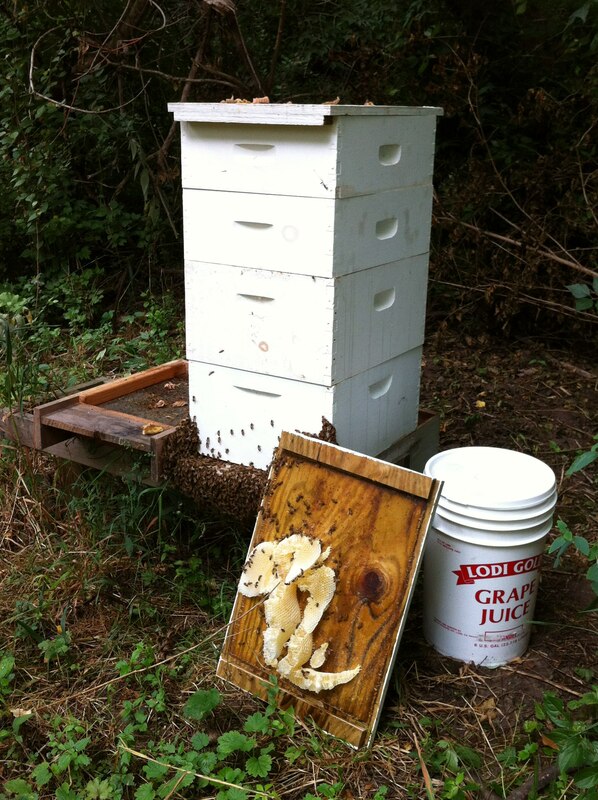 This was the board on the top of the hive, now there is another top board I had on the hive. I left this one in front of the hive for the bees to “recycle” the wax and honey. The bees will strip this bare and move it into the hive. The 6 gallon bucket to the side is about 1/3 full of the comb I had to cut out of the hive to get the top two mediums on. I will be feeding this back to the bees as well. This next picture is a close up and it shows the bees hanging out off the front of the hive. We are having hot weather here in MI and they do this to try and cool off. I had planed on moving the hive to a bottom board with a screen bottom so they could get more ventilation, but I figured I had upset them enough yesterday.